Every letterpress printer—amateur or professional—uses compositors’ tools (tools used in composing handset type) that are essentially unchanged from those of the last century. It would not be too extreme, in fact, to say that some tools, like the composing stick itself, are essentially the same as those used by Gutenberg’s workmen. One of the strongest appeals of letterpress printing is a traditional way of working that extends back in time over 500 years. The type case is a good example of the long tradition of letterpress. Just about every upper case in the English-speaking world has the letters in this order: A B C D E F G H I K L M N O P Q R S T V W X Y Z J U. Why are J and U at the end? Because the case had already been in use for almost 200 years before J and U were added to the English alphabet in the early 17th century. J was added to distinguish certain sounds from I, and U was added about 1630 to indicate the use of V as a vowel. Two hundred years of habit are not discarded lightly, and rather than disturb the established order, J and U were added at the end. For a modern-day equivalent, consider the QWERTY keyboard. Before 1883, when United States typefounders agreed on the standard size for the pica, it was every founder for himself, and no composing stick could have an engraved pica scale on its bed. It was not possible to set the knee to a certain measure without the use of a set of composing rules. These were strips of steel made to different lengths, which could be put into a composing stick to set the measure. The lengths would have to have been specific to each foundry, since one typefounder’s 20 picas was not the same as another’s. Sticks could also be set with a typefounder’s quads for accuracy. In addition to setting the stick, the composing rule was used when setting one line of type over another; by placing the composing rule on the first line, the second could be set much more smoothly. Composing rules traditionally had projections or “ears” by which they could be removed from the stick. By the 1880’s compositors had elaborate fitted oak cases lined with plush to hold a complete set of rules. Excerpts from ATF’s 1897 printing machinery catalogue. Composing and makeup rules, shooting sticks, bodkins, tweezers, rule-bending machine. Spacing adds extra space between the words or letters of inline text, and leading adds it between lines of metal or wood type. Spacing sizes must correspond to your font sizes. If you are buying old type, many cases will come pre-stocked with necessary spacing. If you are buying new type, consult with the seller on where to buy spacing. Leading can be purchased in uncut lengths and cut as needed, or purchased as a set of common lengths. Most old shops had long racks full of every size. Peter Schoeffer is credited with being the first to use leads, or strips of metal, between lines of type to separate them, in 1465. They quickly became indispensable not only for adjusting the amount of space between lines, and the length of pages, but also made handling and moving type in the composing stick easier. Leads are cut with snips or metal saws until about the middle of the nineteenth century. Then small choppers were made of iron, much like paper trimmers today. These cutters relied on simple leverage. Eventually inventors added compound leverage for cleaner, easier cuts in thicker metal. (Smaller hand-held lead cutters made by Rouse eventually came into use in the twentieth century.) Large shops used rotary saws for cutting greater quantities of leads. The mallet and planer are ancient tools for leveling a form of type. In letterpress printing it is essential for every letter to be at exactly the same height of its fellows. The easiest way to do this is simply to lay a flat piece of hardwood on a loose form and give it a tap with a mallet to push down any pieces of type that are too high. Mallets are simply traditional carpenter’s tools; the planer evolved into a thick hardwood block. The unrestrained use of the mallet and planer gave rise to the epithet “blacksmith” for any printer lacking a delicate touch. Line gauges, sometimes called pica poles, are well-known even to today’s printers who have never touched a piece of metal type. The oldest ones are square foot-long pieces of boxwood, each face stamped with measurements in Pica, Brevier, Nonpareil, Paragon, and so forth. These therefore date to before 1883, when the typefounders of the United States agreed to move to a standard point-denominated system, and the old type size names were abandoned after more than 400 years of use. 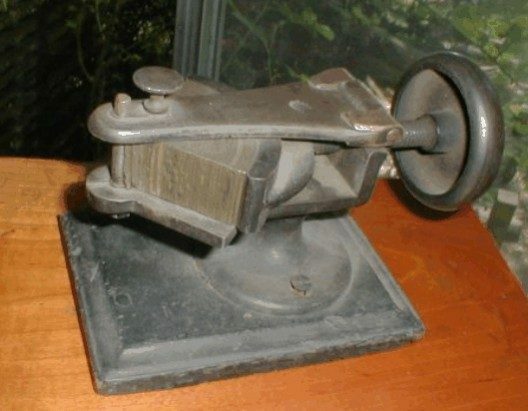 Boxwood line gauges were manufactured by makers of wood type and other wooden appliances for printers. Modern line gauges are made of steel and will usually have measurements in Inches, Pica, Agate (a rarely used measurement today) and sometimes Points. Nineteenth-century line gauges marked in pica, brevier, etc. ; shooting sticks, bodkin. The bodkin is an ancient tool for piercing cloth and leather (the name was applied to a dagger as well.) The Oxford English Dictionary gives its printing use as dating only from 1846, but this is clearly wrong, since Moxon (1683) describes it in detail. The bodkin is useful mainly for extracting a piece of type from a form; it is less likely to slip and damage the face of the type than tweezers, and can get into smaller spaces. 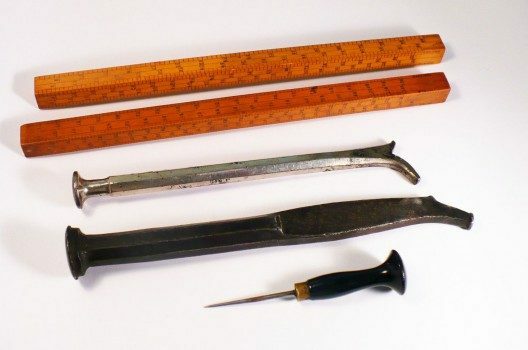 Although one would not think that such a simple tool could be improved, in the nineteenth century manufacturers began offering bodkin points that folded into a pair of tweezers and could be put into one’s pocket—a Swiss Army Knife for printers. The Victorian enthusiasm for decoration produced great numbers of highly ornamented typefaces, borders, and ornaments. It also led to the practice of curving pieces of brass rule into ornate flourishes. Brass rule had to be annealed first—that is, heated in a flame and then slowly cooled until it lost its temper and became malleable. At first, until the early 1870’s, this curving was done with a simple pair of round-nosed pliers. By the 1880’s mechanical devices had been developed to make the work easier, and every typefoundry sold these “rule-bending machines.” Some used a crank to pull the rule between two rollers of different diameters. Golding & Co. of Boston sold a device in which the rule was inserted between two curved segments of a circle and then the segments were squeezed together to produce the curve. Very few rule benders have survived, yet at the height of the craze, in the 1880’s, there would have been one in almost every printing office. Compositors’ and other printers’ tools are shown in the equipment sections of many type specimen books from the 1860’s on. 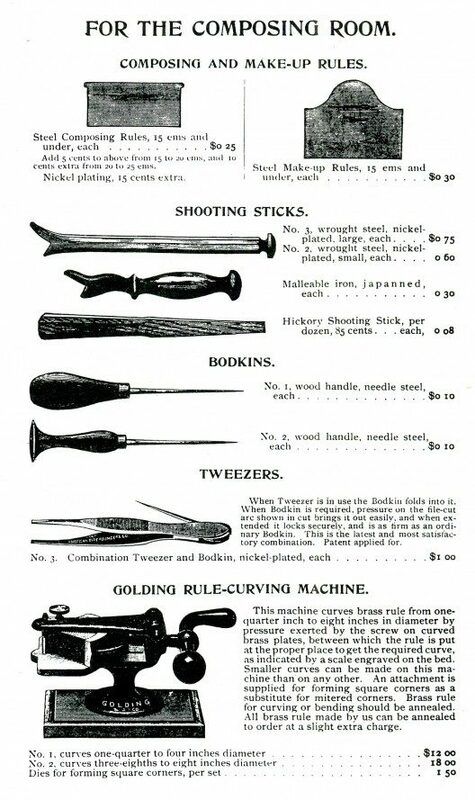 American Type Founders Co. issued two catalogues of nothing but tools and supplies for printers, one in 1897 and another in 1905. These two ATF catalogues are excellent references for the great variety of printers’ tools at the end of the nineteenth century. Golding & Co. Rule-bending machine. Slug cutters are used to cut leading and rule material to needed lengths. They come in a variety of styles and sizes, from hand-held to robust cast-iron table-top versions. Miterers are used to shave the end of rule or border material from 90 degrees to 45 degrees for creating a box border. They can also be used to shave a kerned pair of letters to fit more closely. Type saws were another staple of old print shops. At their core, they were small versions of a woodworker’s table-saw. They are measured in picas instead of inches, and are capable of very fine adjustments. They are used to cut both lead rule and wood, and can be used to quickly trim stacks of leading to a matching size or to kern wood type. Like any power tool, these can be incredibly dangerous, so great caution and care should be taken whenever using one. This specialized spacing material allowed compositors to set type in curves and angles. Similar to slugs, circular quads come in a variety of lengths but with one smooth curved surface and staggered “steps” on the opposite side. Type aligns between a sandwich of curved surfaces while it’s locked in by filling in the staggered “steps” with spacing material. 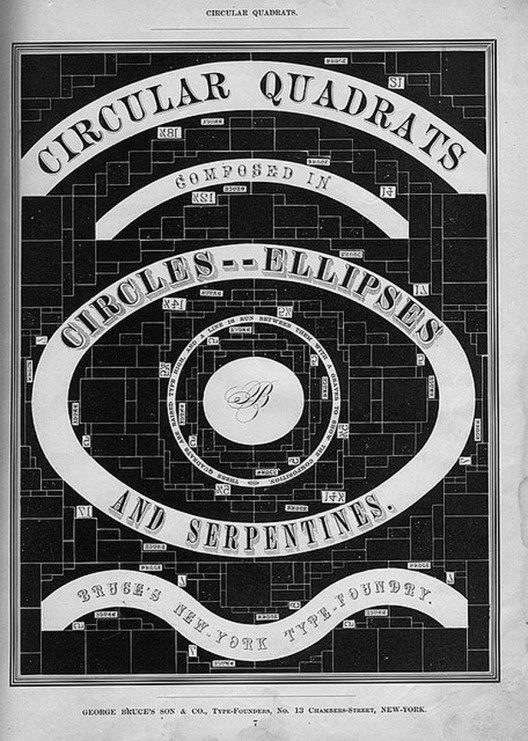 Circular quads as featured in the Bruce’s Type Foundry catalog.